Strangers, the somewhat confusingly titled sequel to 2008’s The Strangers, has officially wrapped. Directed by Johannes Roberts, responsible for this summer’s fun shark-em-up 47 Meters Down, the film will chronicle another group of innocents terrorized by a group of masked psychos. In Bryan Bertino’s original, the action centred on a young couple played by Liv Tyler and Scott Speedman, who had not such a pleasant evening at a remote summer cabin. 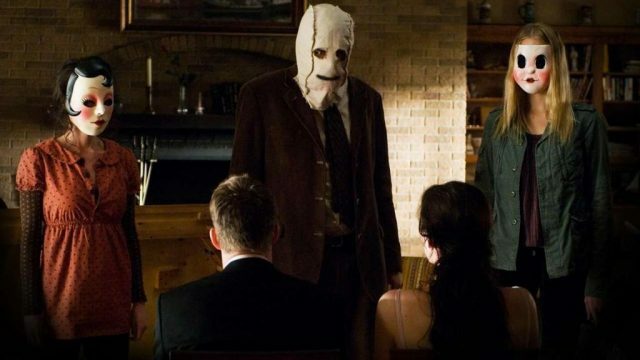 This time around, it’s an entire family who plunge into a slasher nightmare, and as previously reported, they’ll be played by Christina Hendricks, Bailee Madison, Lewis Pullman and Martin Henderson. We also know a little about the plot, in which the family will find themselves stuck in a secluded trailer park where they’re forced to take refuge in an abandoned trailer for the night. Then the power goes down and, under cover of darkness, the three masked maniacs emerge from the shadows and take them to the outer limits of fear. It sounds like classic horror material and with a promising cast, it looks as if fans have something to anticipate. At a push, we might see Strangers in late 2017, though it’s more likely to rear its horrible head sometime in early 2018. Either way, all signs point to it ably carrying the torch handed down by the original.